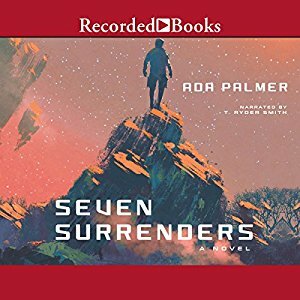 Ada’s second novel, book two of the Terra Ignota quartet, Seven Surrenders, is published today, so at last people who have been waiting since reading Too Like the Lightning last May can read it. 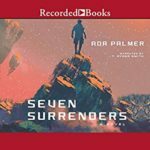 If anyone hates cliffhangers so much that they have been waiting to read Too Like The Lightning until Seven Surrenders came out, you can safely now read both, because there’s a proper pause at the end of Seven Surrenders before the other two volumes. You’ll still really want the other volumes, but it has satisfying volume completion. The series will be complete in four books. The third book, The Will to Battle, is currently scheduled for December, and Ada is presently writing the fourth and final book. 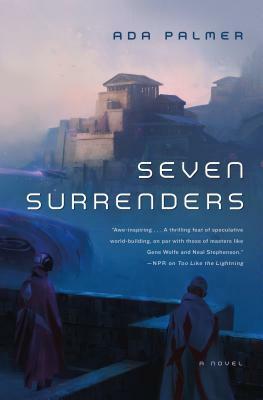 Seven Surrenders is available in hardcover and e-book form, and is also now available as an audio-book, narrated by T. Ryder Smith. Links to interesting and worthwhile reviews, interviews, and blog posts Ada has written about the book will be added to this post — so more links will appear here as time goes on. There was a Crooked Timber seminar on the books. Not having much luck finding anyone who will sell me (in uk) an ebook. Because traditionally North America and the Commonwealth were two different markets, authors get to sell rights to each domain separately, and make more money than if they sell world rights to one publisher. However, this depends on publishers in both spheres deciding to buy the book. No UK publisher has yet picked up Terra Ignota, so the rights to the ebooks aren’t available in the UK. When and if a UK publisher picks it up, they’ll make an e-book available. I appreciate how phenomenally infuriating this is, and also how archaic in an age of global commerce. But writers do need to make a living too. You could write to your favourite UK publishers and suggest they might want to publish them. Or you could buy a physical copy from the US. Sorry. I got my copy today, and yes, I’m one of Those People who have held off reading Too Like the Lightning until the second book is out. So now I have some *gleeful* catching up to do! Now you can read them both together and that will be an excellent experience! My (US) ebooks lack all the beautiful typesetting that I’m told the paper versions have. So you might as well get the hardbacks, instead of the annoying empty boxes that keep showing up instead of what I assume should be Greek. It isn’t a question of disliking the printed books, it’s a question of having nowhere to put the damn things. We’re hoping the Hugo nomination may help Ada’s agent find a UK publisher.